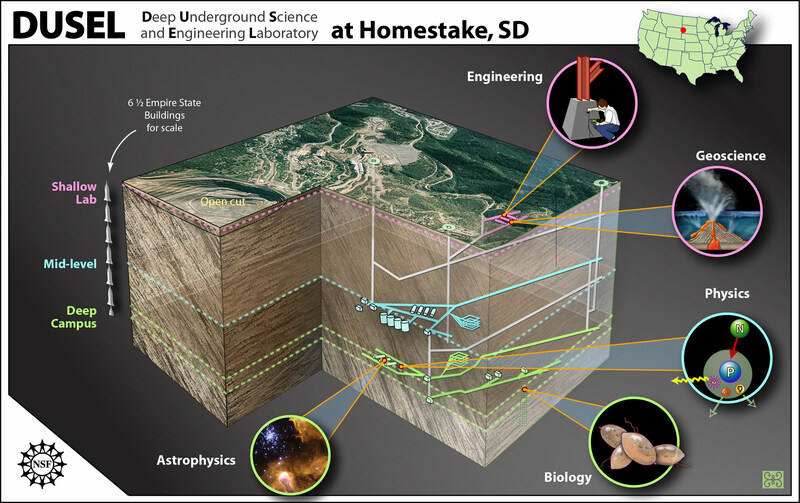 The Deep Underground Science and Engineering Lab (DUSEL) at Homestake will address the underground needs of all of the major scientific fields included in the NSF solicitation process: particle and nuclear physics, geology, hydrology, geo-engineering, biology, and biochemistry. Homestake is the deepest mine in North America with rooms at 8000 ft., well-suited for experiments that require extremely low cosmogenic backgrounds: in particular, the search for neutrino-less double beta decay and relic dark matter. The Yates formation has well characterized strong rock that can support deep large cavities for very large multipurpose detectors for proton decay and neutrinos from many different natural sources. These large detectors can be used for long baseline neutrino experiments using beams from US accelerator laboratories located at appropriate distances from Homestake. The large number of tunnels, shafts, boreholes, dedicated access and well known patterns of water flow will allow studies of the dynamics of the earth’s crust and critical issues of carbon sequestration and rock mechanics over long time scales and many length scales. The dedicated access and the diverse geology at Homestake are well-suited for studies of microbiology and life at extreme depth.